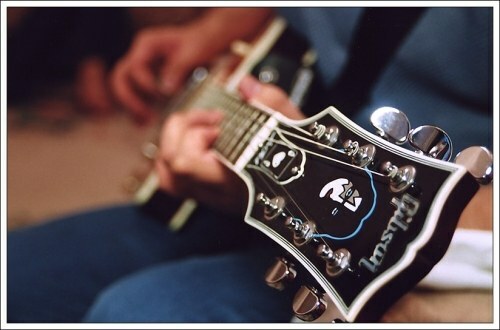 If your guitar fretboard is uneven, this does not mean that the tool is broken. The most common problems are too much distance between strings and frets, and the distance is too small in order for the string to sound. Proper tuning of the fretboard allows you to solve both of these problems. - half-meter steel strip or ruler. Put her on her knees this way as if you are going to play it. The following measurements do not spend on the instrument, lying horizontally. The force of gravity will give the neck an unnatural position that will negatively affect the measurement result and, as a consequence, the configuration of the tool. Put the steel strip or line on the neck so that one end touched the first fret, and the other last. Measure the clearance between the seventh fret and the ruler. If the clearance is less than 0.15-0.2 mm, take the adjusting wrench or screwdriver and turn the nut of the anchor counterclockwise. This will weaken the anchor rod and increase the distance between strings and fretboard. If your test shows a gap of more than 0.4-0.5 mm, tighten the truss rod. Twist the nut anchor clockwise. Do not attempt to adjust the neck, if you are sure that you will be able to do it right. The wrong setting can cause damage to the anchor and, as a consequence, the whole of the fretboard.